Playstation was the next area on my trek so I delved into the mega-booth. I was pleased to see a lot of indie titles on display. I can’t possibly talk about all of them, but I have to mention some that really stood out to me. 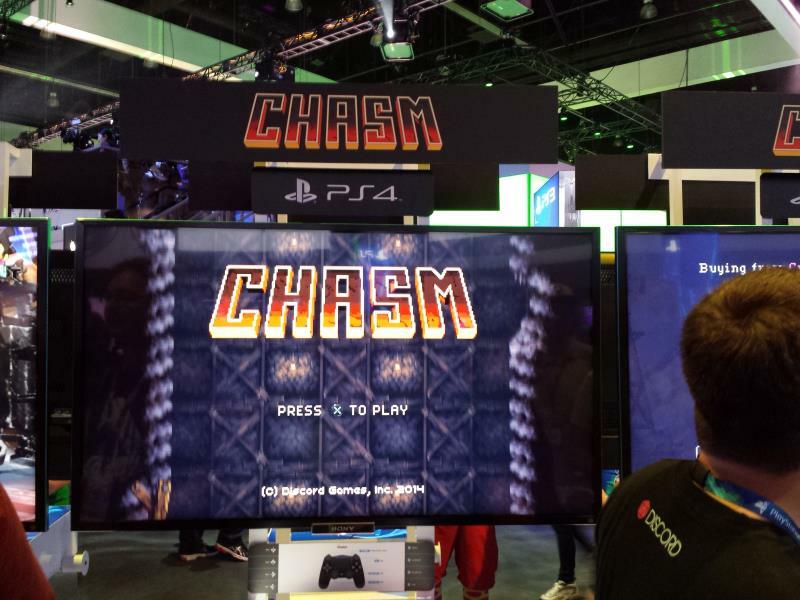 I have to mention Chasm, I’ve been a backer for this game from the first time I heard of it. It’s a procedurally generated, classically styled adventure game which reminds me a lot of Ys III. You go into a randomly generated dungeon, defeat monsters, get loot, gain XP, and repeat. It differs from rogue-likes in that your randomly generated dungeons are persistent; if you die you can try again in the same dungeon. This gives subsequent play-throughs a “2nd quest” sort of feel for infinite replay-ability. I chatted with James Petruzzi who gave me some helpful insight on Discord’s experiences in the indie dev world. Thanks James! Another attention grabber was the extremely Metroid-like game, Axiom Verge by Thomas Happ Games. Axiom Verge really captures the feeling of playing Metroid for the first time, and takes it to the next level. There are tons of cool weapons, giant boss battles and all the exploration and isolation of the early Metroid games. I can’t wait for this one. Thomas was there chatting with fans and we spoke a bit about his experiences with XNA (Axiom started out as an XNA game! ), getting picked up by Sony, and the state of indie gaming in general. Velocity 2X definitely surprised me. I almost dismissed this FuturLab game as a top-view space shooter, but then quickly got sucked in by it’s teleportation mechanic. You can teleport with a cursor, and leave teleporters as you go and jump back to a previous point on the level. This lead to some unique puzzles I wouldn’t have associated with the shoot em up genre. Things got even more surprising when I docked my ship and went into a side view platformer mode, where the pilot of the ship blasts her way through more baddies, and the teleportation mechanic helps with long jumps and zipping past walls and obstacles. And I wrap it up with Xbox in part 4!